You Should Be Able To Sell Your Product! Elon Musk and Tesla! Elon Musk, the owner of Tesla Motors is facing a court battle in New York because there’s a lot of New York based local car dealerships that want to stop him from selling his electric cars through direct sales. Now, I think this is completely crazy and anti-competitive! It does not make a lot of sense to me! If a car company chooses to sell directly to their own customers, then let them! The local dealerships feel like they’re being cut out of the equation, which is a loss to them and their sales…. however, these car dealerships are NOT Tesla dealerships, and they would not have been selling Telsa Motors cars anyway! They are other car dealerships that don’t have anything to do with Tesla! Therefore, it makes no sense that they’re trying to stop a car company that has never sold cars in New York before from selling it’s cars directly to customers! I hope that Tesla Motors will win this particular lawsuit, and we will see if this anti-competitive activity will continue! If Elon Musk, and Tesla Motors want to bring their own dealerships, and showrooms, and other means of sales into any particular state, then they should have the ability to do so, in my opinion! It was also announced today that Tesla Motors has come out with “quickchange battery stations” for their Tesla cars, that basically would allow you to swap out batteries in your electric car as quickly as it takes to fill the gas tank in your current vehicle. You do have to reuse those batteries… if you leave them then you would lose the value of the battery, and if you have to buy a whole new battery, from the place that does the swapping of batteries then it would cost a lot more than just the energy, obviously! So, they’re working out those particular kinks, but they have an automated robotic “quickchange method” to do it that looks interesting… it’s very similar to a company based out of Israel that had a similar vision; but that company declared bankruptcy and went under because electric cars didn’t catch on, however, Tesla Motors is doing quite well in selling cars, and a much higher rate than the industry thought they would! They’re turning out to be very popular! A Portable Raspberry Pi by Ben Heck! I want to share with you one of my favorite podcasts! It’s absolutely awesome for the geek in all of us, and that would be “The Ben Heck Show!” Ben Heckendorn’s “Ben Heck Show” is awesome! And, I can definitely appreciate the fact that he abbreviates his last name to “Heck”… it does make for an interesting show name! But, at any rate, this show is awesome! This particular set of shows: Part One and Part Two… I wanted to share with you because it shows how he is has taken the Raspberry Pi and he’s turned it into a small, handheld portable… which is right down my alley since also do the netcast called the “Hand Held Hack!” So check it out! I’m also cross posting it over on the “Hand Held Hack” website, and I think it’s going to be an awesome show for you to see so that you will see what’s possible with some of the tools that Ben has! The New Steve Jobs Movie Trailer is Out! So, the new trailer is out for the Steve Jobs biographical movie that’s just called “Jobs,” and I have a link to the YouTube video right above this article. I have mixed feelings about the movie; I think it’s possibly going to be good. And, what little I’ve seen, based on the trailer, seems to indicate that Ashton Kutcher may actually get to act, which is unusual in and of itself! But, I will withhold judgment on it until after it comes out. I don’t know if I’ll see at the theater; I may wait and watch it on Bluray, or on Netflix, that will depend on my state of mind when it comes out, but it does look interesting! First Day of Summer and Longest Day of the Year! Yep. Today. Welcome to summer, welcome to the longest Friday at work for the whole year. You’re welcome. Do you use Handbrake? Do you code video for the Roku, even Plex on the Roku? Well, here you go! Presets for Handbrake that are highly optimized for your Roku! Rokoding – Video Encoding for the Roku! How about a whole suite of free software this week?! “The free collection of portable software for everyone! Lupo PenSuite is a completely free suite of portable programs and games. This Suite is designed to simplify the user’s life, by collecting the best suites and portable applications available on the Web. Optimized to be loaded on a USB flash drive and brought always with you, this Suite works perfectly well on any other device. It includes over 160 highly selected portable programs and games (7-Zip, Audacity, CCleaner, eMule, FileZilla, Firefox, GIMP, Instantbird, IrfanView, Notepad++, Opera, SumatraPDF, Thunderbird, µTorrent, VLC and many more). You can also easily customize your suite adding portable apps from our broad software database. All you need in one package. 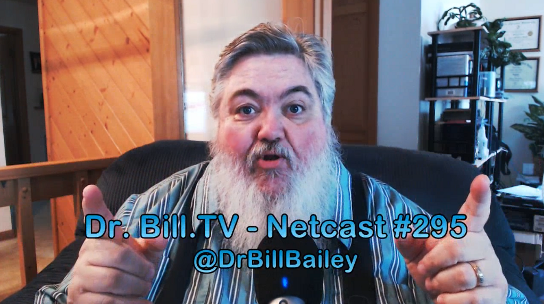 So, as you may, or may not, have realized, the Dr. Bill.TV netcast is coming up on it’s 300th episode! How cool is that? So, as usual for these big events, we have a new contest! Drumroll please! This new contest will be for a brand-new, in the box, shrink-wrapped, BoxeeTV! Yes, you heard that right, you can have your very own, free BoxeeTV by winning this contest! And, sadly, Phred cannot enter, as an employee of Dr. Bill Bailey.NET. But then, neither can I! So, there you go. And now, you may ask, how do I enter? It’s simple. All you have to do is send an e-mail with the subject line “Dr. Bill contest,” now remember, an e-mail to this address: DrBill@Dr.BillBailey.NET with the subject line: “Dr. Bill contest.” That will enter you into the drawing. There’s no need to send multiple e-mails. One e-mail will do. So, send those e-mails in and tell your friends, “You can win a BoxeeTV from Dr. Bill!” And, be sure tune in for the 300th episode to find out who wins! So, this week we also had WWDC, an Apple event, in which they introduced a lot of new Apple-y things like a new version of iOS, and the new MacBook Air. But perhaps the most controversial introduction was the new Mac Pro… It is small. Very small. And, not very expandable in the normal sense of the word. 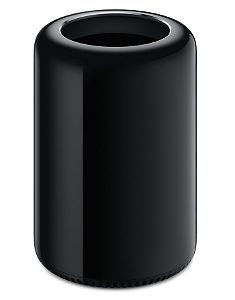 In fact, it looks like a black, rounded off, 9 inch tall trashcan! Not exactly what the Apple fan boys wanted to see!